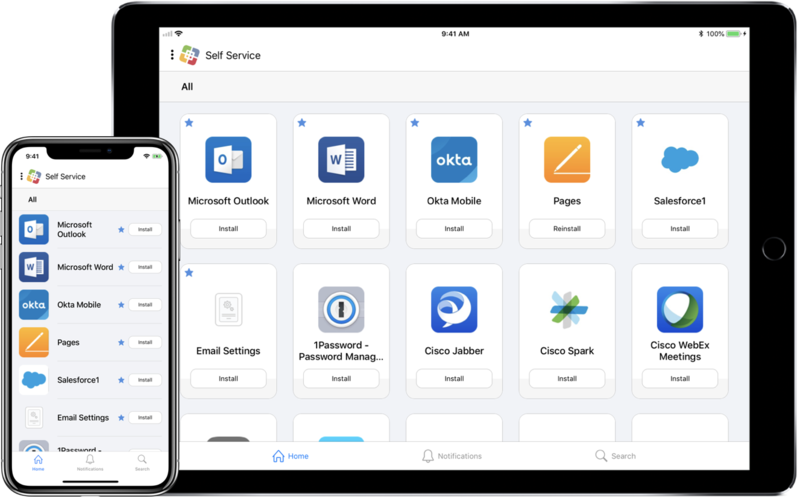 Jamf Self Service for iOS allows you to distribute configuration profiles, apps, and books to mobile devices for users to install. You can use Jamf Pro to group configuration profiles, apps, and books in categories, which makes those items easier to locate in Self Service. Users tap Self Service to browse and install items using the intuitive interface shown in the screen shot below. If iBeacon monitoring is enabled in your enviroment, Self Service is the component that detects when a mobile device enters or exits an iBeacon region. Jamf Self Service for iOS can be installed on devices with iOS 7 or later. The latest version of the Self Service app available in the App Store requires devices with iOS 10 or later. For more information on the Self Service levels of compatibility, see Installing Jamf Self Service on Mobile Devices. To require or allow users to log in to Self Service, you need an LDAP server set up in Jamf Pro. For more information, see Integrating with LDAP Directory Services. Note: The Self Service app requires mobile devices with iOS 7 or later. For earlier iOS versions, the web clip is installed by default. For more information, see Self Service Web Clip. Find out how to manually distribute Jamf Self Service for iOS to mobile devices.